Location: Co. Cork. Near Glandore. Ireland. Grid Reference: 51° 33' N 9° 5' W.
This recumbent stone circle is located on the edge of a rocky terrace with a view of the sea about a mile away. The word Drombeg (Drom Beag) means 'Small ridge'. Drombeg is one of several unusual R.S.C's which were built in Ireland, and which were orientated towards the Solar cycle (midwinter sunset). The circle consists of symmetrically arranged stones with the two tallest or 'Portal stones' to the north-east forming an entrance, and the lowest to the south-west called the Recumbent or Axial stone. 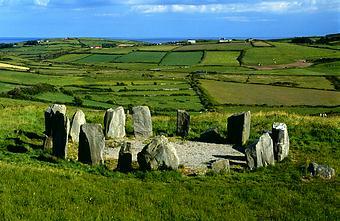 The number of stones in the circles of this region can vary from 5 - 19; there are 17 at Drombeg. Of the original 17 pillars of smooth-sided local sandstone erected in a circle of 9.5m (31ft) in diameter, only 13 remain. 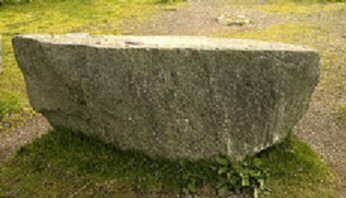 To the left of the north-east entrance is a portal stone 2.2m (7ft 2in) high; its opposite is the 1.9m (6ft 10in) long recumbent which has two egg-shaped cup-marks (one with a ring around it). Excavations in 1957 and 1958 revealed cremated bones in a deliberately broken pot wrapped with thick cloth and buried near the centre of the circle along with 80 other smashed sherds, four bits of a shale and a collection of sweepings from a pyre (recalling similar deposits at the Scottish recumbent circle of Loanhead of Daviot). 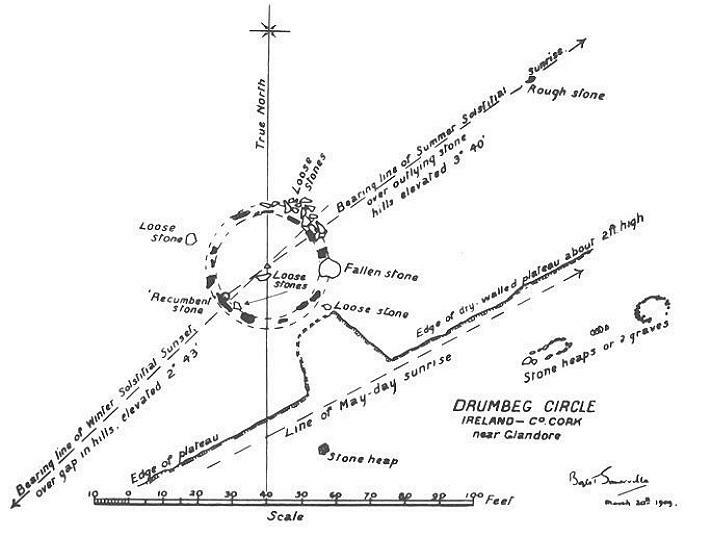 The excavation of Drombeg by Fahy (JCHAS 1959) revealed that the entire inner area of the circle was covered with a gravelled floor layer up to 10cm thick. About 40m (44yds) to the west of the circle are the remains of two stone-built prehistoric huts joined by a common doorway. The smaller has a cooking place 1.5 x 1.1m (5ft x 3ft 6in) on its eastern side; this was still in use in the 5th century AD. This prehistoric kitchen had a flagged trough in which water was boiled by dropping red-hot stones into it. Recent tests confirmed that using this method, 70 or more gallons of water could be boiled in almost three hours. The stones were shaped to slope upwards to the recumbent itself. The midpoint of this stone was set in line with the winter solstice sunset as viewed in a notch in the distant hills; the alignment is good but not precise. On the perfectly flat upper surface of the recumbent stone (right), are two shallow depressions (cup-marks), one surrounded by an oval carving. 1). O.P.W. (Office of Public Works) Site Plaque.